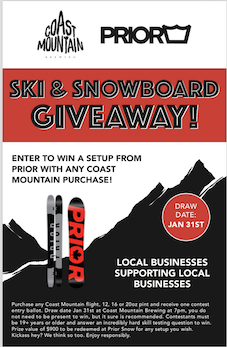 What could be better than a chance to win a set of Prior skis or a snowboard?! Starting on January 1st and running for the entire month, each time you order a Coast Mountain beer in the tap house you can enter your name in the draw to win. We will be picking a name on January 31st, and although it is not required to be present to win, we highly encourage it.